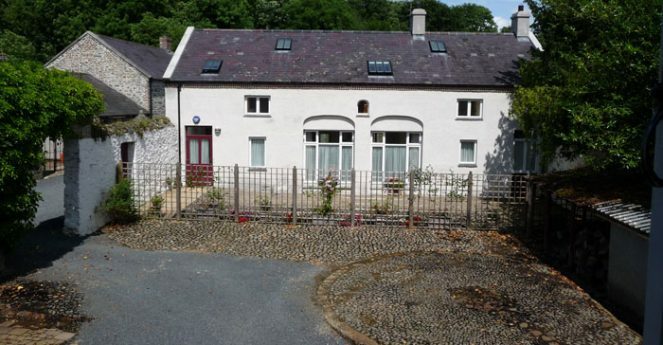 Entrances to the two self-catering apartments, Lisnagade and Coolnacran, in the former coach house. In the past a donkey was used to pump water from a pump that was located in the stone circle in the foreground. An antique gate of striking design leads to the driveway. To the left you can see a starting point for the boundary walk. The restored stone barn on the left has distinctive niches for the doors. 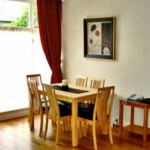 Both self-catering apartments have oil-fired central heating and a traditional-style gas fireplace. The woodland and boundary walks wind their way alongside fields and a deciduous forest through the lands of Loughbrickland House, and pass through two ring forts. 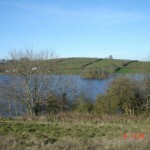 The lake is a ten minute walk from the Courtyard. 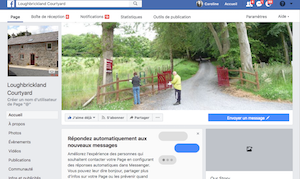 Families, walkers, cyclists, fisher people, and golfers are especially welcome at our comfortable self catering holiday rentals just off the A1 near Banbridge, Co Down. 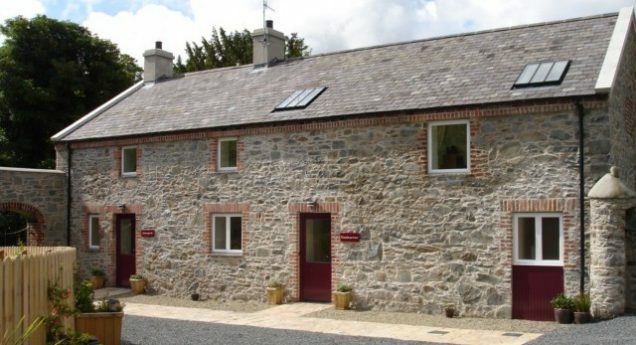 ‘Lisnagade’ (sleeps 4) and ‘Coolnacran’ (sleeps 6) offer ideal surroundings in which to unwind and provide an ideal base from which to explore the delights of Co. Armagh and Co. Down – even day-trips to Belfast (Titanic) and the Giants’ Causeway. 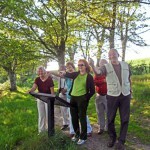 Or enjoy a wander along our beautiful Woodland and Boundary Walks (1.9/2.5Kms) which lead you around Whyte’s estate past historic Coolnacran Rath and Johnston’s Fort. Our Welcome Basket of delicious home-baked wheaten bread, tea, filter coffee, orange juice, milk, sugar, locally produced butter and Evelyn’s preserves with perhaps a piece of traybake will give you a good start. We are now offering a Breakfast Package Option to book when you make your reservation. This will save frantic shopping on your first evening! Details are on our booking form. 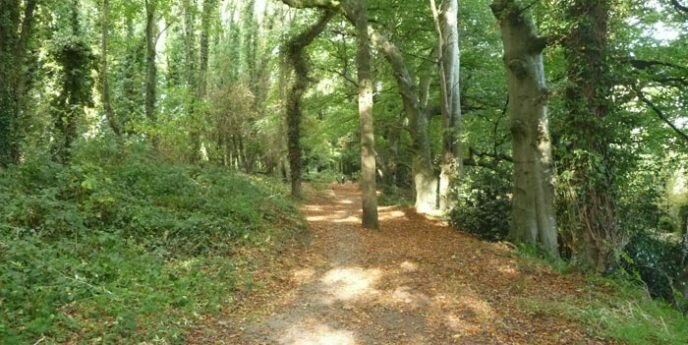 Enjoy a wander along our beautiful Woodland and Boundary Walks (1.9/2.5 Kms) which lead you around the estate past historic Coolnacran Rath and Johnston’s Fort. Then, luxuriate in our King sized duvets with 300 thread count covers! We seek to support green tourism in every possible way: recycling, composting, locally sourced food and natural products, energy efficient buildings and appliances. Planning a party, a workshop, a class or a meeting? Our Gate Lodge might fit the bill! 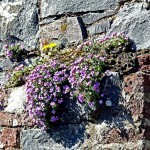 Have a look at www.loughbricklandgatelodge.com and contact us. 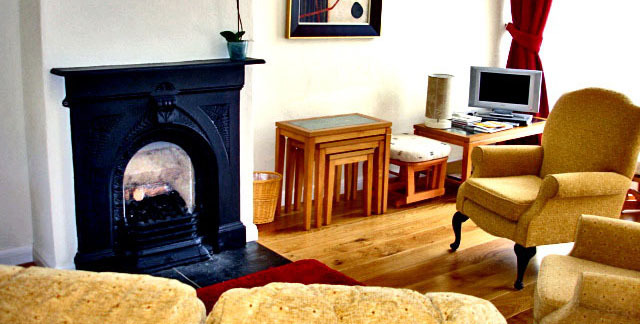 The Coach House has been converted into two self-contained apartments to the highest standards of quality and comfort by local craftsmen using local materials. Find out about the many opportunities for walking, fishing, golf, cultural activities, improving your health and fitness and shopping in our area. Our situation ensures that we enjoy the best of both worlds – a sense of rural calm and tranquillity, but also easy access to major centres of commerce, employment and culture. Learn about availability, our daily and weekly rates, special offers and partnerships with local restaurants and golf clubs.